Attention, Naperville! 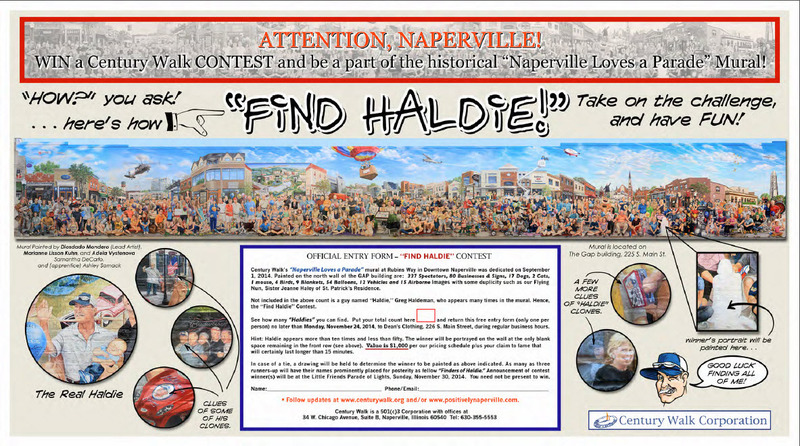 The Century Walk is having a contest to fill the last front row spot on the "Naperville Loves a Parade" mural (located at Rubins Way in Downtown Naperville -- painted on the north wall of the GAP building). See how many "Haldies" (images of a guy named Greg Haldeman), you can find in the mural and submit your total count on an official entry form no later than Monday, November 24, 2014 to Dean's Clothing, 226 S. Main Street, during regular business hours. The winner will be announced at the Little Friends Parade of Lights on Sunday, November 30, 2014. You need not be present to win. Contest hint: Haldie appears more than 10 times and less than fifty. The winner of the contest will be portrayed on the wall at the only blank space remaining in the front row. Value is $1,000 per our pricing schedule plus your claim to fame that will certainly last longer than 15 minutes. In the case of a tie, a drawing will be held to determine the winner to be painted. As many as three runners-up will have their names prominently placed for posterity as fellow "Finders of Haldie." Click the image below to download an official entry form. Fill it out and submit it at Dean's before November 24, 2014!